After more than two years of false starts, this time, everyone seems agreed that the three elephants at the Toronto Zoo are ready to pack their trunks and head to warmer climes. "It's for real," Julie Woodyer of Zoocheck Canada said. "I can’t believe it myself." Zoocheck has led the way in arranging for Toka, Thika and Iringa to be retired to the PAWS sanctuary outside of Sacramento. "It’s all come together. The stars have finally lined up." The trio will be heading out by truck in mid-October, right after Canadian Thanksgiving. Originally, the plan was to fly them out on a plane that would have been chartered by Bob Barker, former host of The Price is Right. But the plan fell apart when the Canadian Air Force changed its mind. Traveling by truck will be a lot less expensive than the $800,00 price tag that Barker offered to pay for the flight. Zoocheck says it expects the cost to be around $200,000. The elephants will be traveling in two climate-controlled trucks for about 50 hours, including stops for food, rest and health checks. Three elephant managers and two veterinarians will travel with the convoy. 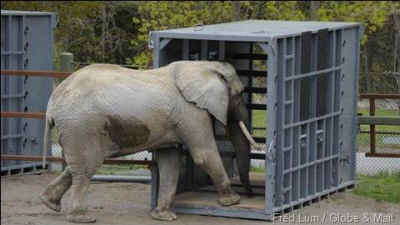 The Association of Zoos and Aquariums (AZA) has fought the transfer all the way, apparently seeing it as the thin end of a very dangerous wedge as public opinion swings away from supporting the idea of keeping elephants in captivity, standing around in small spaces for their entire lives for the sole purpose of entertaining visitors. At one point in the debate over the future of Toka, Thika and Iringa, when the Toronto Zoo management and board were swinging in favor of the move, the AZA, which is basically a trade association for the zoo industry, retaliated by pulling its accreditation of the Zoo. The PAWS sanctuary is currently home to three African elephants and five Asian elephants. They live on hundreds of acres of natural terrain that's a good approximation to their natural habitat, with lakes and pools along with heated barns for when the weather gets chilly.